Yesterday I made sandwiches. Throughout the winter and spring I make bread, but occasionally we purchase a loaf. Most often the purchased loaves are fairly decent loaves, but once in a while we happen to be at a store that doesn’t have the finest choices, so we grab a loaf of what appears to be the best option to get us through until I can make more. In summer and autumn everything is different. We look to a local baker to supply us and our CSA members with bread from June through October. For the past few years we have connected with Suz Rowley and Brian Taylor of Renard’s European Bake Shop. Renard’s is a small family-owned bakery located just outside of the Green Lake area. This delicious partnership has allowed us to spend more time in the summer growing vegetables than baking bread. 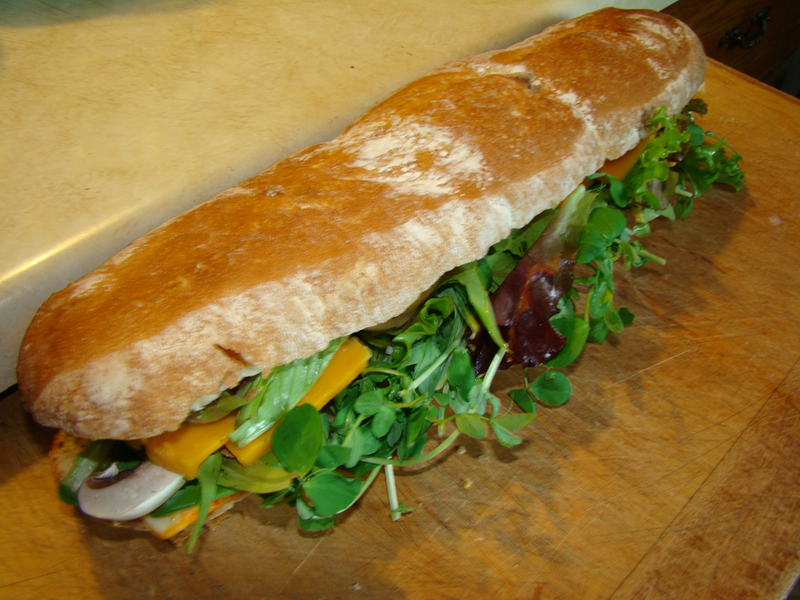 Delicious summertime sandwich oozing with pea greens and made with Renard’s Ciabatta bread. Back to the store-bought loaf and sandwiches I made yesterday. After I made the sandwiches I decided to count the ingredients in this loaf of bread I had purchased for $3.89. There were 20 (not including the nutrient enrichments in the flour). I asked Suz to share some information about the flour and ingredients she uses when making bread. For high quality and reliability she uses King Arthur “Sir Galahad Artisan Bread Flour”. You will not find them in Renard’s bread. Their breads have anywhere from 4 to 14 (or so) ingredients. The bread with 4 ingredients is their Ciabatta. It simply has the four ingredients needed to make a loaf of bread: flour, yeast, sea salt, and water. That’s all. No more is required. The bread with 14 ingredients? It’s their 9-grain bread and is made with flour, water, rye meal, barley malt, seed/grain mix (sunflower, sesame, triticale, oats, millet, flax, wheat), honey, sea salt, and yeast. From Renards: “Artisan Breads and European styled pastries made from scratch with no mystery ingredients.” An adage our family truly appreciates. So, do you know what’s in your bread? If you get your bread from Renard’s, or another thoughtful baker, you do.